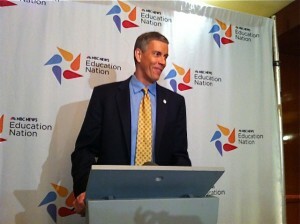 We got a glimpse into Secretary of Education Arne Duncan's vision for the American public education system Monday during his conversation with journalists at Education Nation. Recruiting qualified educators, and supporting, elevating, and giving incentives to teachers are his top priorities. Anticipating that 1 million baby-boom generation teachers will be retiring in the next few years, Duncan announced the launch of Teach.gov, a full-scale national campaign on the part of the federal government to recruit teachers. According to Duncan, the site lists 2,000 teaching job openings as of today, and the department will be going around the country to recruit freshmen, sophomores, and seniors from colleges and universities. Duncan also spoke on a number of different topics to journalists. Here's a roundup of themes he touched on. "It’s tough work. You need courage, tenacity, and have to believe in your heart that every student can learn. It’s the hardest professions that it exists. Great teachers are like Picasso and Michelangelo, inspiring students. It’s amazing to watch. It takes intellectual [knowledge] of the content. At the end of the day, the most important thing it takes is passion... And it takes time – there will be days when you actually take a step back, you cry and figure out what you did that… there'll be a child who does phenomenally well, and mom would get beaten at home at night. Then you have to help the child deal with the sadness at home. You have to stay with this for the long haul." "We have to elevate the status of a teacher. It’s a huge part of the solution. Countries that outperform us – Finland, South Korea – they’re getting the best and brightest going into education. In five years, I want to have best in the world. That’s my goal." "It’s tough right now, but we have to look over the horizon. We need to pay teachers more, and great teachers more on top of that. For those who are volunteering to go work in rural or urban areas, new math and science teachers, special education teachers. Anywhere we have more need. We have to reward excellence. In math and science, we’re usually around 21st or 25th. We have to pay math and science teachers more money -- another $5000 or $10,000 a year – to make it better." "Teach Grants offer $4,000 a year that can be applied to undergrad tuition, if they work in poor schools. And they can take off $16,000 from tuition. And we’ve increased incentives by $60 billion. There’s the Income-Based Repayment program, where after 10 years of public service, including teaching, all your college debt is gone." "The parental piece is huge. Parents are children’s first teachers and most important teachers. If parents aren’t part of the solution, we’ll never get to where we need to get as a country. The Department of Education has to change, and this is where we under-invested. We’re looking to double the investment to $270 million, investing in great programs to make difference. Great things will happen." "For kids who go to underperforming schools, parents are sometimes working two jobs. [For those families,} academic enrichment should be at the heart of every school, after school. If we want parents to be engaged, we have to open up our doors. They have to have libraries, gyms, pools, rec center. Those things don’t belong to me or to schools, they belong to the community. Our schools have to be the heart of the neighborhood." "Teachers don’t get enough support or mentoring they need. They struggle with classroom management skills. Those master and mentor teachers helping them through rough days is hugely important. We have to build real career ladders. Teaching is a craft – it takes years to develop. So we can’t let those young teachers burnout in the first few years. Teachers have been beaten down, but they used to be revered. They have to be treated like doctors – they’re doing the most important work in our society. We have to elevate the profession."